Hide Dark Under Eye Circles with Effective Concealer Tips! 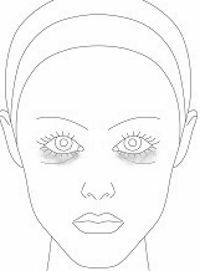 Under eye circles are easy to cover up with the right makeup and know-how. Depending on the severity of your discoloration, I'll show you how to use concealer and color corrector to create brighter looking undereyes. The thing that will make the most difference to your discoloration is corrector. First try and see if it goes away using concealer alone. If it doesn't, then you know that it's time for a color corrector. Concealer Corrector is probably your most important buy . Its job is to neutralize whatever type of blemish you will be working on. When choosing a corrector for dark under eye circles, certain colors are known to counteract different types/ colors of blemishes. Once you've identified your blemish color, choose the right corrector to counteract it. Regular Concealer in a color one shade lighter than your foundation.This is the concealer that you would use on a regular basis for mild cover-ups, that you will cover with foundation. If you're not going to cover it, use one that matches your foundation color. A Concealer Brush or Sponge are both able to get the job done. Brushes are better at applying, while a damp sponge is great for blending. Luminizer with light reflecting particles. No glitter! That is, assuming you've just sat to do your makeup with a clean and moisturized face. Using your fingers or brush, gently tap a little bit of corrector onto the dark circle area. Then, use your brush to blend it and even it out. Ensure to cover the whole discolored area. The corrector cancels out the dark circles by neutralizing the discoloration. 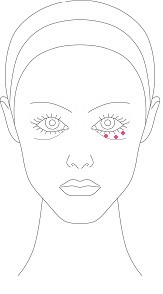 Apply the concealer in a few evenly spaced dots under the eye. Take your chosen brush and wet it a little. Maybe with a mist of water, or put dip it in and dry it with a cloth. Start blending in gentle dabbing motions. You can use your sponge for this as well. The wetness makes it a little more sheer, and helps to blend it a little more beautifully. Now because this is NOT a lotion, you don't want to rub it in. Make sure you also go into the inner corners of your eyes, and just over the outer edges, following the your cheekbone. The concealer must just sit on top of the skin, so you just dab to blend it onto the skin evenly. Go as close to the lashline as you can. Then make sure to blend the outer rim as well. This is so that you don't see an outline where the concealer begins/ends. If you'r using a stippling brush, you can blend it in soft, sweeping, circular motions. Remember that when blending, your movement has to be feather light on the skin. Luminizer or highlighter contains light reflecting particles so that it makes the area just that much brighter. It's advisable that you purchase one without glitter. After luminizer you are officially done! Don't forget to be very gentle when dealing with eye area. With the dark under eye circles covered, foundation comes next. If you are going to be applying foundation over the face, try not to move the concealer around. Carefully apply your foundation by blending it into the edge of the concealer.